I am also sharing approximately how many hours I worked on particular platforms each month, I don’t count sourcing items since I don’t go on trips JUST for sourcing anymore. All my trips thrifting are for myself & if I happen to find things to resell..well that’s awesome. And some hours I’ve only shipped because I listed the items I sold in previous month’s. 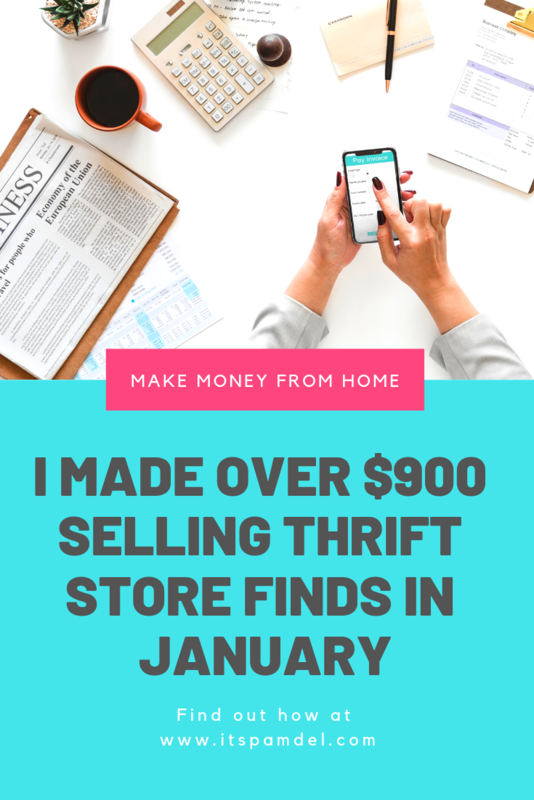 So let’s get into how much time I spent reselling thrift store finds in January. I had lofty goals for the month of January…ok actually I didn’t. I posted my goals last month when I shared how much I made in 2018 reselling on Poshmark. But I fell short of those goals. Like big time. But even for my minimal hours put in for the month I still made some decent change, I’ve switched my focus to items with a higher resell dollar to help make anytime I put into reselling very much worth it. That goes for all platforms I am posting to. I sent over a box of high end items for consignment on The Real Real during a period I was overwhelmed with STUFF. A lot of the items came from my personal closet from past campaigns I did with high end designers that The Real Real accepts or from things I thrifted at amazing prices. A few things I thrifted I wasn’t sure on authenticity, I mean I was 95% sure but don’t like to take that chance when reselling so I love that The Real Real will authenticate items for you when putting them on consignment. I’ve been taking a step back from selling on eBay, it’s a platform I think is better when I’m putting full time hours & attention into it. Since reselling isn’t my main focus for income at the moment I’ve taken down all my items & closed my eBay store. I made a few small sales before doing that though. I might come back to eBay when I have more time to pour into it, but for now I’ll just be a buyer on eBay. Well moving onto ThredUP, I’ve been sending over items from my eBay store that I don’t think are worth my time to list on other platforms. It’s not tons of money but it is more than I would get from donating it & these are items that have just sat on a shelf as I’ve neglected my eBay store. I plan to start sourcing & sending more to ThredUP Luxe after clearing out my stale inventory. I had previously been on Mercari before it had any fees deducted & loved it, I decided since I was stepping back from eBay to focus on reselling clothes on Poshmark only I would redownload mercari to sell any hard goods I found worth a pretty penny…or things I had laying around the house that I didn’t need. Mercari is very straight forward & simple, very much like Poshmark but you can sell pretty much anything. It tells you exactly how much you will make after fees, shipping is simple & listing is fast. I sold a Vitamix, Vitamix accessory & a camera lens I no longer use on it during January. All of those sold the same day I listed them, I have a handful of others items that have yet to sell but it isn’t costing me any money to have them up. I only pay a fee once I sell an item (& it is automatically taken out of your payment). Ok ok, now what you’ve probably scrolled past the rest of the post for. The numbers for how much I made reselling items online.